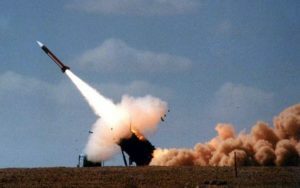 The US State Department Wednesday said it approved the sale of Patriot missiles worth $3.5 billion to Turkey that has signed up for Russia’s S-400 missiles following reluctance from the Trump administration to supply it with the military equipment. The Department said it informed the Congress of its decision to implement the sale of 80 Patriot missiles, and 60 PAC-3 missile interceptors and related equipment, to Turkey. The sale will increase Turkey’s defense capabilities, the Department said in a statement. “The proposed sale will increase the defensive capabilities of Turkey’s military to guard against hostile aggression and shield NATO allies who might train and operate within Turkey’s borders,” the statement said. The decision came hard on the heel of US President Donald Trump announcement he was withdrawing American forces from Syria, following a telephone conversation with his Turkish counterpart Recep Tayyip Erdogan. It is unclear whether both decisions are interlinked. Turkey since 2015 has placed orders for the system but Washington overlooked the demand. Given the continuous US disregard, Ankara and Moscow in 2017 signed a contract for Turkey’s acquisition of S-400 with the installation planned for October 2019. The sale of the US military hardware hangs on the decision of the Senate. The House had previously delayed delivery to Turkey of US-made F-35 fighter jets over Ankara’s intention to buy the Russian weaponry. Written by: KanelkaTagba on December 20, 2018. Posted by KanelkaTagba on Dec 20 2018. Filed under Headlines, World News. You can follow any responses to this entry through the RSS 2.0. Both comments and pings are currently closed.